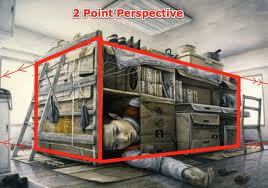 Teacher Theresa McGee has a wonderful 2-point Perspective Lesson for grade 5 and up. Like all the lessons found at http://theteachingpalette.com, you will be supplied with the proper grade level, duration, supply list, goal, procedure, lesson extensions, vocabulary and assessment rubrics. Awesome.